In an article published last week (here), we revealed that the Ministry of Justice (MoJ) had opened a 2-month consultation into extending the fixed costs regime to include all fast track claims (including a separate NIHL regime) and so-called ‘intermediate cases’. To read Extending Fixed Recoverable Costs in Civil Cases: Implementing Sir Rupert Jackson’s proposals, click here. This week, members of the legal industry have spoken out on the implications of the consultation proposals. ‘Efficiencies in process and procedure are important. Fixing recoverable costs does not mean fixing actual costs’. Adopting a Darwinian approach to fixed recoverable costs, the MoJ explained that the calculated figures at each stage of proceedings ‘reflect the amount of work which an efficient and effective provider would undertake’. The insinuation here, therefore, is that claimant firms that are unwilling to take on cases governed by extended fixed costs will be ‘inefficient’ and/or ‘ineffective’. Overall, the MoJ considers that implementing Sir Rupert Jackson’s proposals will have a positive impact. It estimates that there is an opportunity for solicitors to take on more cases (at least 17,000 fast-track cases and 11,000 ‘intermediate cases’ annually). ‘It is unclear to what extent claimant lawyers might be able to identify at the outset which individual claims might be cheaper to process’. In edition 202 of BC Disease News (here), we compared current defence spend in NIHL claims against defence spend under the proposed fixed fee scheme (assuming 80% of claims were paid and 20% repudiated under the new scheme) and found that defendants were better off under current handling with a repudiation rate of 50% and above. Even though settlements may be reached more quickly in fixed costs claims, there is a risk that settled case numbers might fall if claimant solicitors are forced to ‘reduce the time and resource they spend on cases’ to counteract the effects of reduced income. Of course, much will ‘depend upon the behaviour of defendants in such settlement negotiations’, but the MoJ foresees that legal costs saving could lead to an influx of professional negligence proceedings, in which unsatisfied claimants challenge claim outcomes. If so, claimant firms and professional indemnity insurers will welcome the Supreme Court’s recent ruling in Perry v Raleys Solicitors  UKSC 5 (reported here). In respect of the claimant industry, the impact assessment concludes that small firms may struggle to compete with larger ones, while new and existing providers may expand to meet demand. [i] ‘Lawyers concerned by figures underpinning fixed costs reform’ (1 April 2019 Litigation Futures) <https://www.litigationfutures.com/news/lawyers-concerned-by-figures-underpinning-fixed-costs-reform> accessed 4 April 2019. 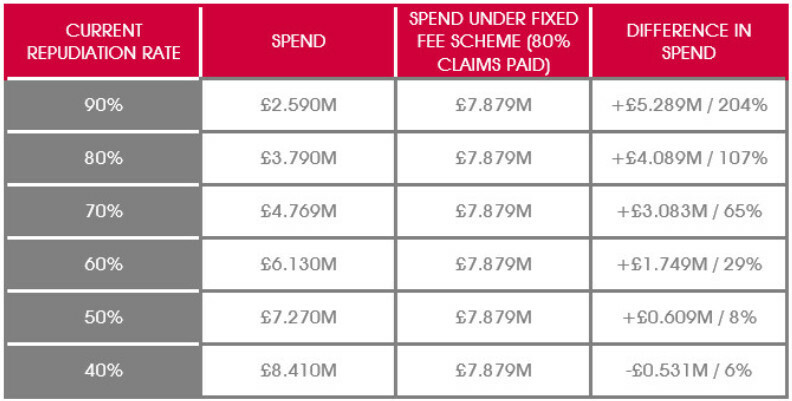 [ii] Neil Rose, ‘Fixed costs impact: “Less income per claim but more cases”’ (Litigation Futures) <https://www.litigationfutures.com/news/fixed-costs-impact-less-income-per-claim-but-more-cases> accessed 4 April 2019.